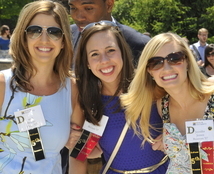 Each June over 1,200 alumni return to campus to reconnect with friends, faculty and the University. Help your classmates and friends find you through the Online Directory by providing your most recent contact information. Supporting our alumni – even years after they graduate – is part of DePauw’s DNA. From career networking, to informative webinars with leading DePauw alumni and faculty, to service opportunities with fellow alumni, the Office of Alumni Engagement provides programs and services that build community among DePauw’s 35,000 graduates across the globe. Receive regular correspondence from DePauw University. This includes the quarterly DePauw Magazine and monthly e-newsletters that highlight alumni news, upcoming events, and information on arts and athletics. Benefit from career resources, including access to online networking groups, such as DePauw’s official LinkedIn group, and webinars featuring DePauw faculty, staff and alumni. Be invited to special events happening in your area, sponsored by one of DePauw’s 17 Regional Chapters. Be able to find any of your classmates any time through the Online Directory, or by contacting the Office of Alumni Engagement at (877) 658-2586 or alumnioffice@depauw.edu. Have an opportunity to influence the next generation of DePauw students by making a student referral or gift to the University. Have opportunities for travel and continued education with other alumni.